Announcement Handcrafted homegoods, functional art, and jewelry made in Orando, FL. New items are added regularly. ❤ Don't see quite what you're looking for? Need a different quantity or color? Message me to discuss custom orders -- typically what I have listed is what's in stock, but it's always good to ask! Handcrafted homegoods, functional art, and jewelry made in Orando, FL. New items are added regularly. I bought this planter to create a personalized terrarium as a Christmas gift for a friend. As my friend loves purples, and geometric shapes, I asked if there was any way to include more purple paint going around the white planter. The seller, Arielle Rassel, kindly accommodated my request. 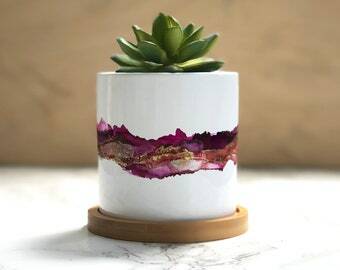 The seller shipped within the time frame listed, packaged the planter well with a hand-written thank you note tucked inside with a magenta, and violet resin gemstone magnet. Arielle, thanks for your note, the cute magnet, and lovely planter! My friend loved her terrarium! This dish is so pretty! I love purple and gold together and this dish combines them quite beautifully. I was able to talk to Arielle about my intention of using it to hold a sprinkling of pills for an evening before I take them at night and she helped me clarify if that would be okay. So far it’s worked quite well. I wouldn’t want to drop it, but I’d naturally feel protective of any dish like this, even though I have no complaints about the quality of this one. Quite pleased. Have you guys seen the new Topanga necklace yet?? Part of the new California Collection, so unique and pretty! Lemesto (Leh-mess-toh) was founded in late 2013 by designer Arielle Rassel, born of an innate desire to create beautiful objects and share them with the world. In college, at the Savannah College of Art & Design, Arielle studied fashion and interior design, and went on to pursue a career designing theme parks (a job she still works by day), but her love of hand crafting never faded. While she did go to art school, she is self-taught in many of her artistic techniques. Wanting a creative outlet different than worlds she helps create by day, Arielle went back to her love of making. The name Lemesto comes from some of her original materials: Leather, Metal, and Stone. Through Lemesto, Arielle seeks to create beautiful handcrafted goods focused on a naturally-inspired aesthetic. 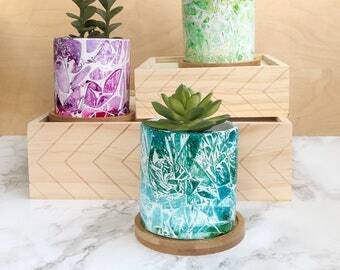 She strives to create pieces that are elegant in their simplicity, yet unique enough to be significant: homegoods that are eclectic but classic, bringing the beauty of nature into your home; jewelry pieces that can be worn by day with simple jeans and a tee, or out at night with your favorite little black dress. Want to follow along with what’s new, behind the scenes, and more? Find the shop on Instagram (www.instagram.com/lemesto.art), and Facebook (www.facebook.com/lemesto). Arielle is a theme park designer/producer by day and a self-taught artist by night. Lemesto was born of an interest in natural materials and a love of making, and focuses on simple but beautiful handcrafted homegoods, functional art, and jewelry.